The homily this morning made some really excellent connections. The priest mentioned that here, in this church, three main mysteries of our faith come together as one. This church, being among the earliest churches built in ancient Rome, was originally dedicated to the Resurrection of Christ (in Green ανάσταση or "anasasis"). At a time when the Emperor was thought to be a god - even the naming of this church was a comment to the Roman authorities - your emperor may claim to be god - but only Jesus, who actually IS God, rose from the dead. You may notice one connection right away: resurrection = anasasis. The Church: Anastasia. 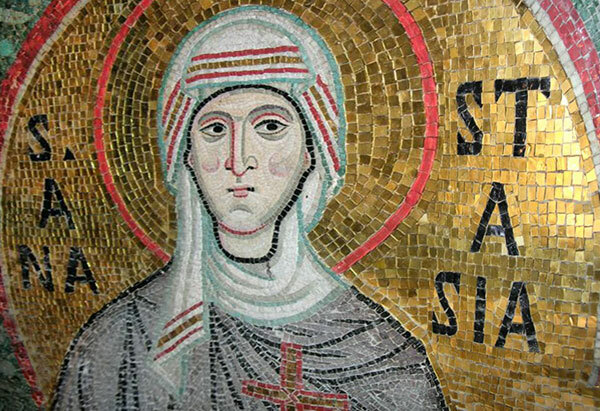 She was martyred in modern day Serbia about the year 308. When her cult arrive in Rome - her memory was brought to this church which, in a way, already bore her name. She was martyred on December 25 (now Christmas day for us), and that is the day on which her feast had been celebrated. Putting all that together, Anastasia brings to mind all the mysteries of Christ: His Incarnation, His suffering (just as she suffered martyrdom) and His resurrection (or anasasis). It was a great way to pull it all together. Now, some history and photos I took this morning. Had we come to this church when it was first built we would still have been able to hear the sounds of chariots and the crowd inside the nearby Circus Maximus, one of the great symbols of the Roman Empire. Now the stadium, like the empire that built it, is nothing more than ruins and memory, while the Faith it strove to crush by the execution of martyrs like St. Anastasia is still here. 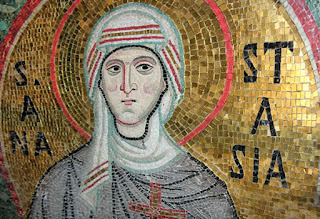 Little remains of factual history of her story, other than remembering her martyrdom in Sirmium, in modern day Serbia, and her name in the Roman Canon of the Mass (Eucharistic Prayer 1). Her cult arrived in Rome towards the end of the fifth century from Constantinople. This was originally a district of Roman houses and shops, part of which was demolished by Pope Damasus in the last 4th century in order to build a small, Greek cross plan church. 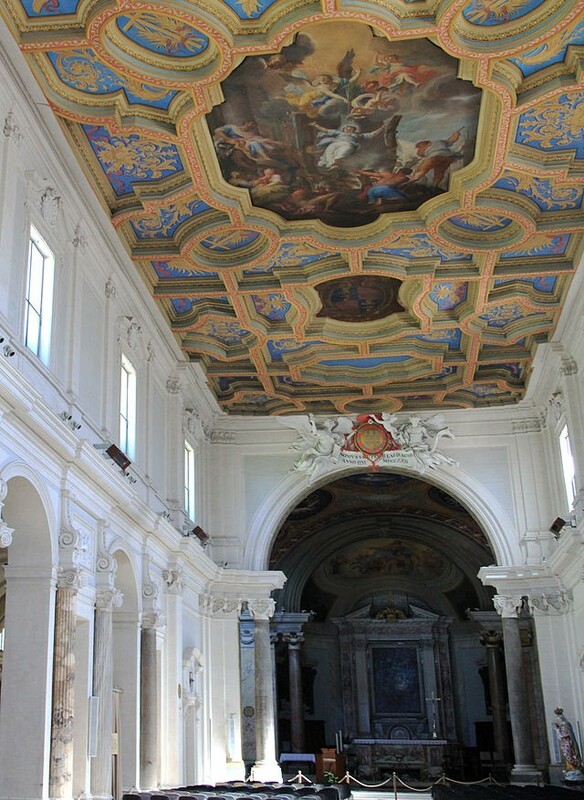 It is possible that this church was originally sponsored by a member of the Imperial family named Anastasia and named in her honor, later being rededicated in honor of St. Anastasia when devotion to her spread to Rome. Another saint associated with this church is St. Jerome. There is a tradition that when staying in Rome he would often celebrate Mass here, possibly because he came from the same region as St. Anastasia. Around the year 500, the nave was extended, giving the church approximately the same dimensions it has today. The unequal width of the aisles, with the right being slightly wider, is a result of older structures being used as foundations for this addition. As the practice of stational Masses during Lent developed, this was assigned as the spot where the procession to St. Sabina began, and as a result, the processional crosses used for the stational processions were kept here when not in use. Another role of the church during this period was as the chapel to the exarch (governor and representative) in Rome of the Byzantine Emperor, who lived on the Palatine Hill. As a result of this, the pope would come to personally celebrate Mass here on Christmas morning, which was also the feast of St. Anastasia. Pope Leo III refurbished the church at the turn of the ninth century, and with an ambo being given by Innocent III in 1210. 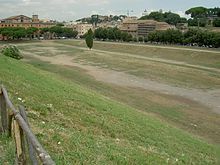 Remains of the original Roman and Gothic windows of the right clerestory can still be seen if one looks back to the church from the area of the Circus Maximus. Sixtus IV undertook a renovation from 1471-1484, which was followed by another in 1510. This presaged a wave of additions and changes over the next two centuries. In 1580, the chapel off of the right aisle was added. Five years later the high altar was constructed, being moved to its present location in 1644. The chapel off the left aisle, balancing that across the nave, was added in 1615, and the current façade was constructed from 1634 to 1640. Finally, the interior underwent a massive renovation in 1721-1722, giving it the appearance it has today. The pillars separating the nave from the aisles were reconfigured, and the walls and ceiling covered with stucco decoration. Minor restorations were carried out in the course of the nineteenth century. As you enter the church you see written above: "Adoremus" (let us adore), preparing us for the work in which we will participate - the Sacrifice of the Mass. In the center of the painted ceiling above is St. Anastasia rising to Heaven following her martyrdom - palm branches (symbols of martyrs) are found as decorations throughout the church. Entering the transept (the heart of the original church) you discover an altar whose patron is St. Turibius of Mongrovejo - an early bishop of Lima, Peru who had recently been canonized when this altar was dedicated. 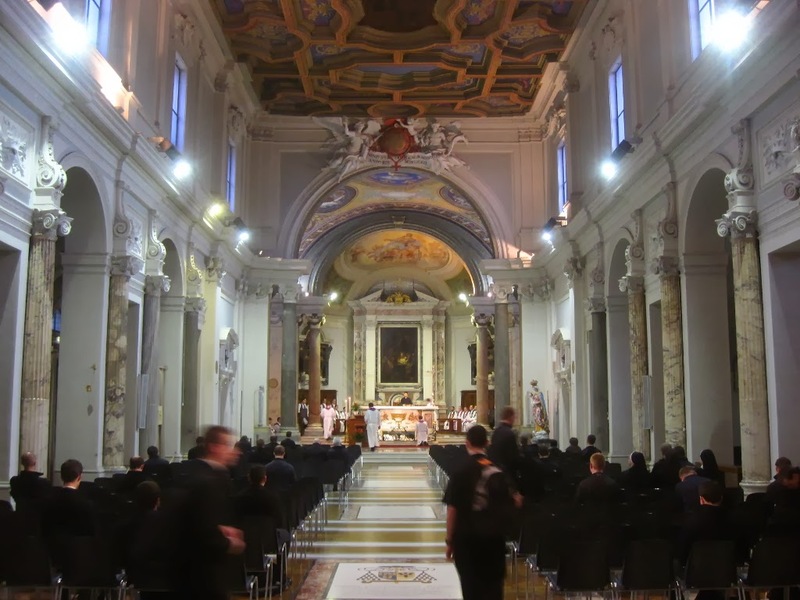 (St. Turibius also happens to be the patron saint of the main chapel at the Pontifical College Josephinum - where I went to seminary). Behind the main altar, in the apse, is an image of the Nativity - which is appropriate since St. Anastasia's feast day was December 25. Under the altar is a beautiful marble statue depicting the saint in death. Looking up once more we are reminded of the witness of the many martyrs - then and now - who, as the painting says, "fought with the Lamb, that the Lamb would conquer."